A collection of opinions, rants and writings by a grouchy old cynic. Any facts contained within are accidental. If you try, you can fail. Miscellaneous texts mostly stuff I've written but have yet to convert to html. Everybody has their own preferences for the way they work and how their computer screen presents their software to them. In some other operating systems, you are limited to merely fiddling with the colors and pretty pictures. In Linux and FreeBSD, you have the XFree86 X Window System (XFree86(tm) Home Page). You have an incredible amount of flexibility and choices. See http://www.PLiG.org/xwinman/ for some idea of this variety. The following is presented for those who may be unfamiliar with the fvwm2 window manager or the customization of "desktops" in general, other than changing icons around on a mostly static, one-proprietary-way-fits-all kind of desktop. I use the fvwm2 window manager (http://www.fvwm.org). It is small, fast, and easy for me (a non-programmer) to extensively customize to suit my habits and tastes. It may not suit you. Isn't Linux, the GPL and Open Source about choice? It has a gigantic pile of background and decor stuff that I never use anymore, since I prefer a simple brown background now. Note that it may look even worse in your browser than it actually is. The mini icons used in the button bar are here: grouchicons.tgz 3,479 bytes. You probably want to use some already on your system or create your own. These are 16x16 .xpm icons. desktop 1 (upper left of pager)= rxvt using linux8x16 font, running joe to edit ~/.fvwm2rc, xterm behind. desktop 2 (upper right of pager)= Netscape Navigator. desktop 3 (middle left of pager)= gftp. desktop 4 (middle right of pager)= Netscape Navigator. 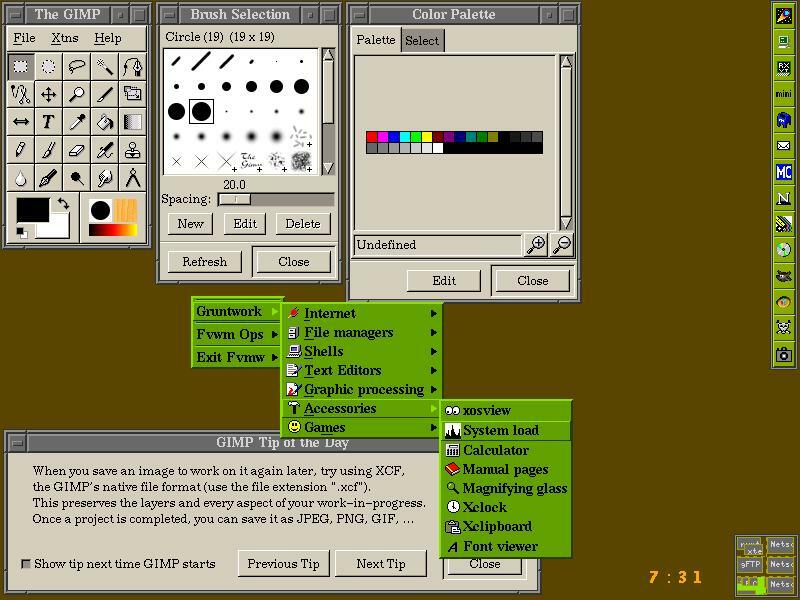 desktop 5 (lower left of pager)= The Gimp. desktop 6 (lower right of pager)= Netscape Navigator. Notice that green cascading menu in the center. This is a pop-up menu activated by a left mouse click on any blank area of the desktop. It is entirely customizable. Mine reflects my preferences, naturally.